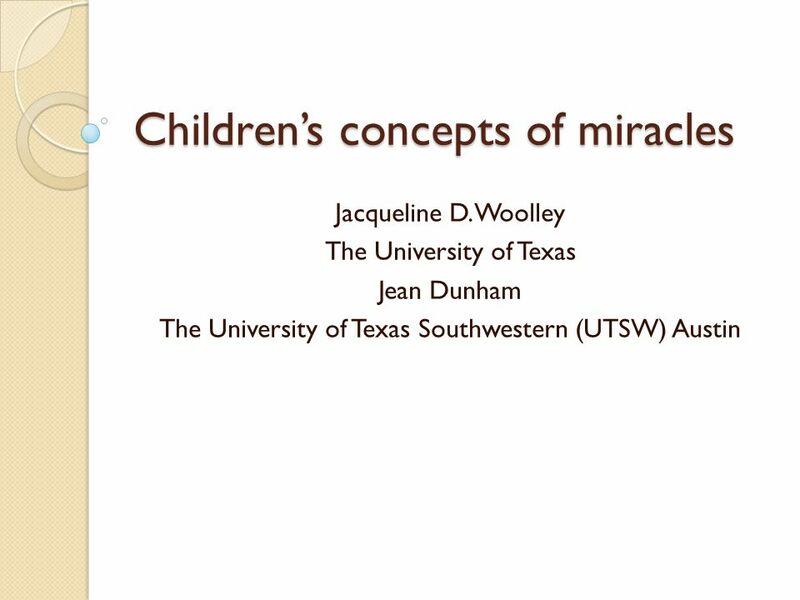 Children’s concepts of miracles Jacqueline D. Woolley The University of Texas Jean Dunham The University of Texas Southwestern (UTSW) Austin. 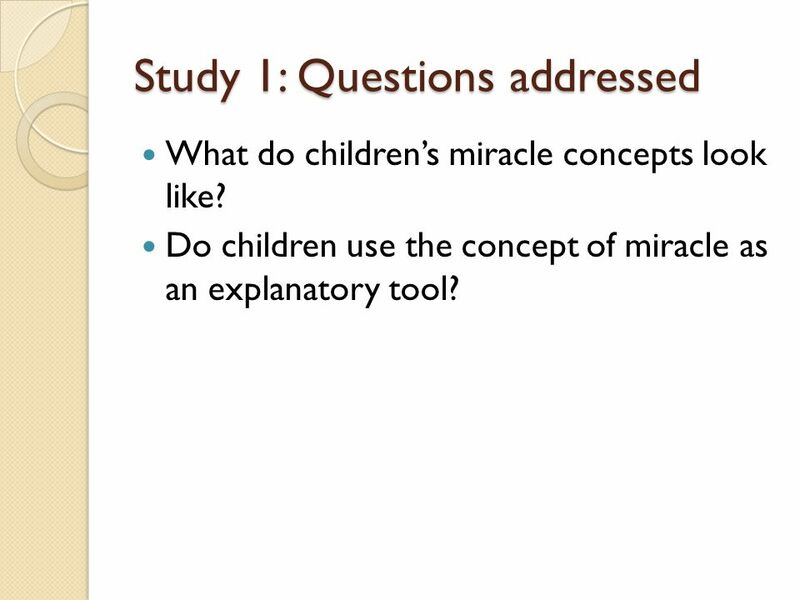 4 Study 1: Questions addressed What do children’s miracle concepts look like? 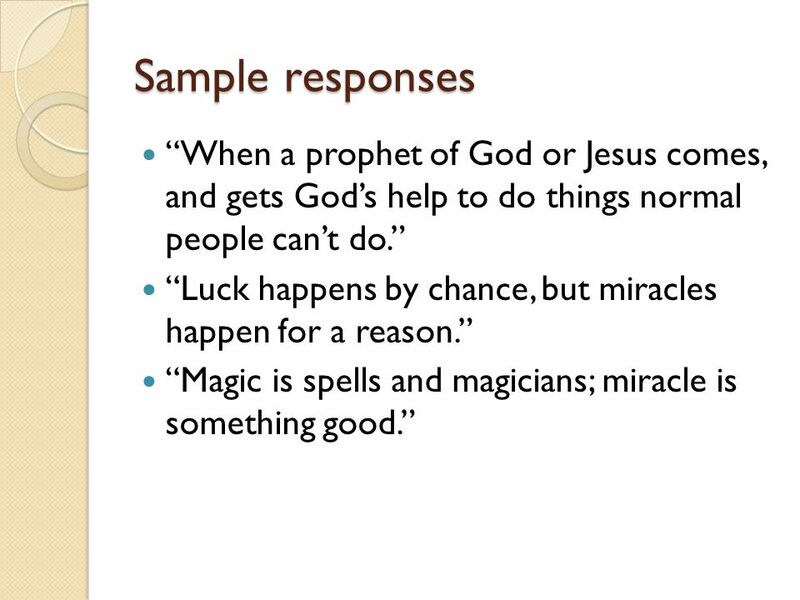 Do children use the concept of miracle as an explanatory tool? 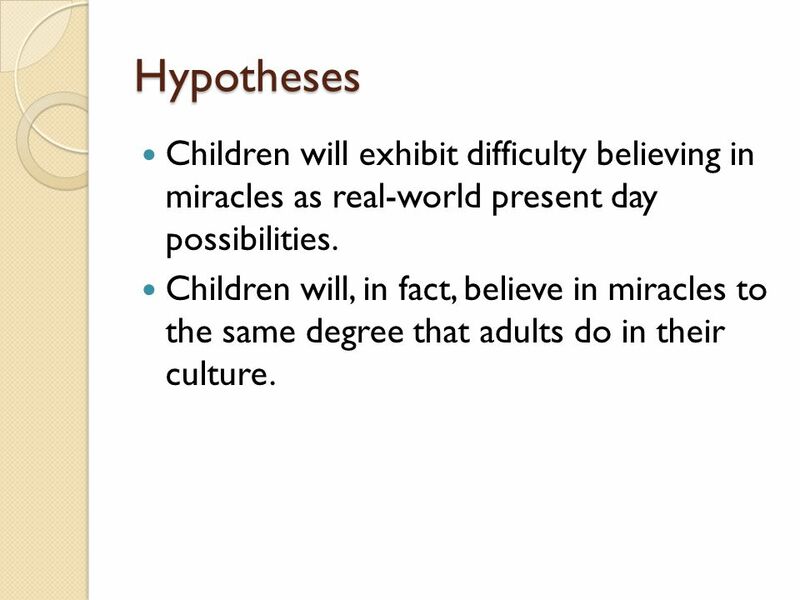 5 Hypotheses Children will exhibit difficulty believing in miracles as real-world present day possibilities. Children will, in fact, believe in miracles to the same degree that adults do in their culture. 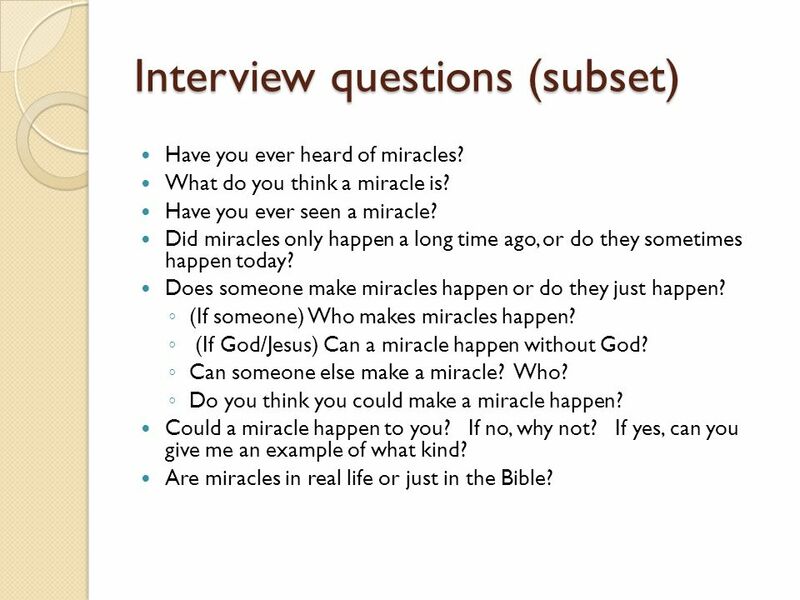 6 Interview questions (subset) Have you ever heard of miracles? 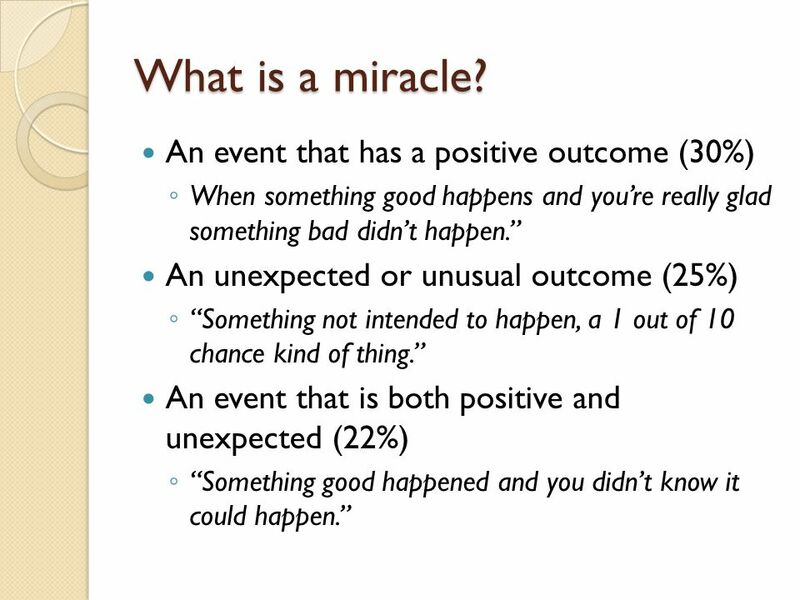 What do you think a miracle is? Have you ever seen a miracle? Did miracles only happen a long time ago, or do they sometimes happen today? Does someone make miracles happen or do they just happen? ◦ (If someone) Who makes miracles happen? ◦ (If God/Jesus) Can a miracle happen without God? ◦ Can someone else make a miracle? Who? ◦ Do you think you could make a miracle happen? 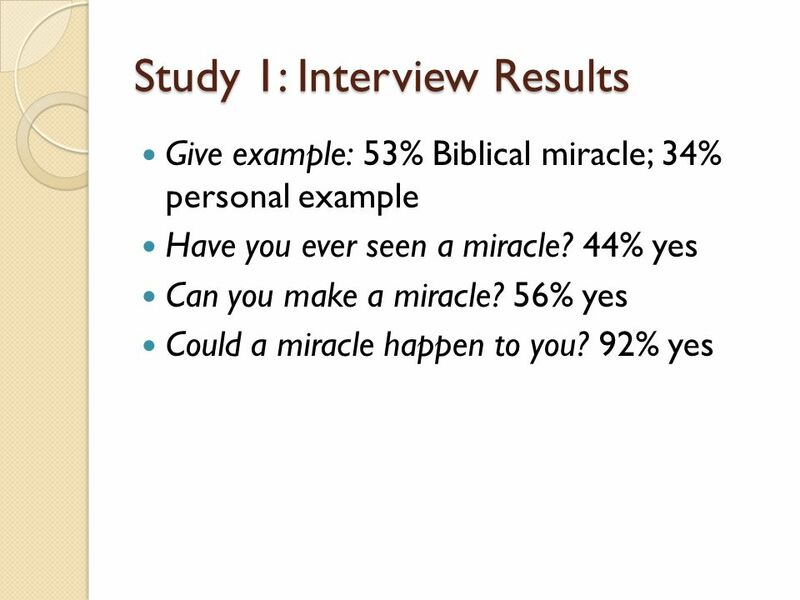 Could a miracle happen to you? If no, why not? If yes, can you give me an example of what kind? Are miracles in real life or just in the Bible? 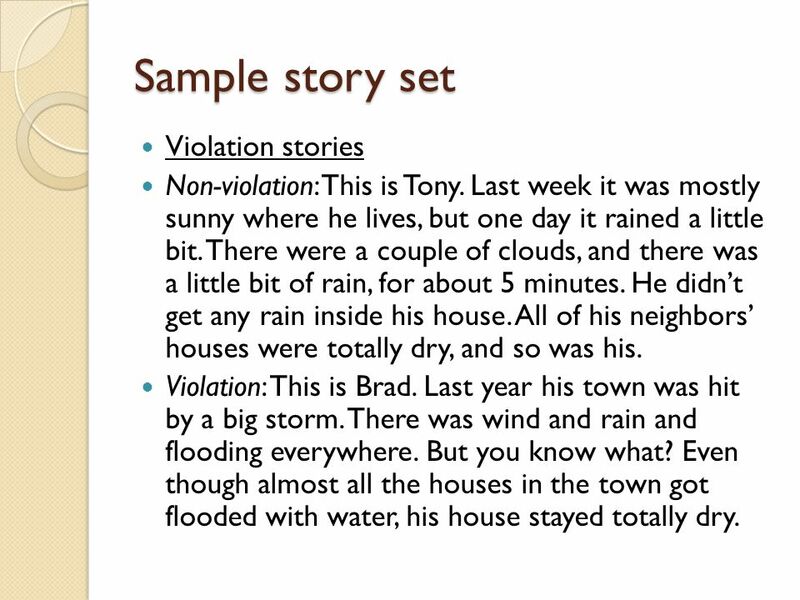 11 Sample story set Violation stories Non-violation: This is Tony. Last week it was mostly sunny where he lives, but one day it rained a little bit. There were a couple of clouds, and there was a little bit of rain, for about 5 minutes. He didn’t get any rain inside his house. All of his neighbors’ houses were totally dry, and so was his. 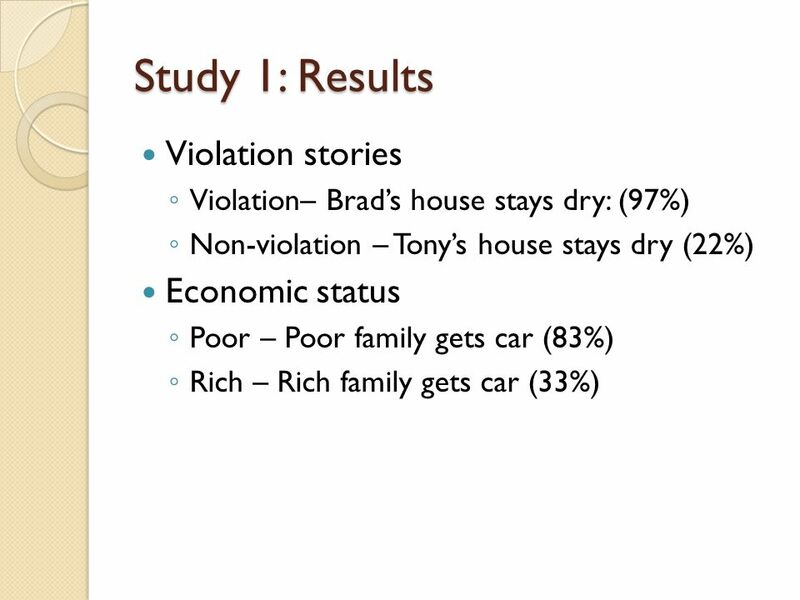 Violation: This is Brad. Last year his town was hit by a big storm. There was wind and rain and flooding everywhere. But you know what? Even though almost all the houses in the town got flooded with water, his house stayed totally dry. 13 Study 2 Sample Story Set Mundane This is Elizabeth. When she was little she got a dog named Jackson. He was a great, fun dog, but when one day he got off his leash. He was loose for three hours and was running all around the neighborhood. By the time they caught him and put him in their car he was so tired he fell right asleep. When they got home to their house though, he woke up and he was fine! Elizabeth took Jackson into the back yard to play when she got home. Improbable This is Elizabeth. When she was little she got a dog named Jackson. He was a great, fun dog, but when one day he got off his leash and got hit by a car. Her family took Jackson to the vet but the vet said he had serious internal injuries and probably wouldn’t live. Jackson stayed at the vet asleep for two whole weeks, and when he woke up he was fine! Elizabeth took Jackson into the back yard to play when she got home. Impossible This is Elizabeth. When she was little she got a dog named Jackson. He was a great, fun dog, but when one day he got off his leash and got hit by a big truck. Her family took Jackson to the vet but the vet could not find a heartbeat, and so he told Elizabeth that Jackson was dead. The family decided to take Jackson home to bury him in the back yard. When they got home to their house though, he woke up and he was fine! Elizabeth took Jackson into the back yard to play when she got home. 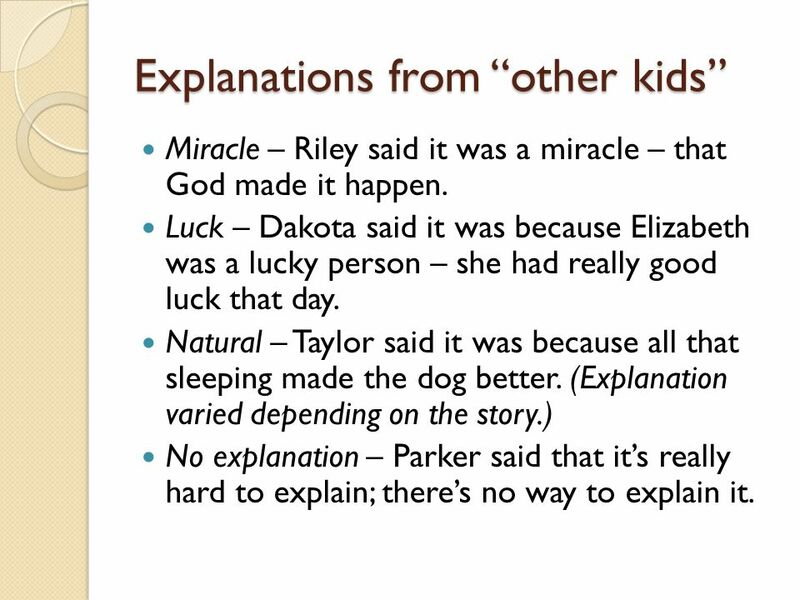 14 Explanations from “other kids” Miracle – Riley said it was a miracle – that God made it happen. Luck – Dakota said it was because Elizabeth was a lucky person – she had really good luck that day. Natural – Taylor said it was because all that sleeping made the dog better. 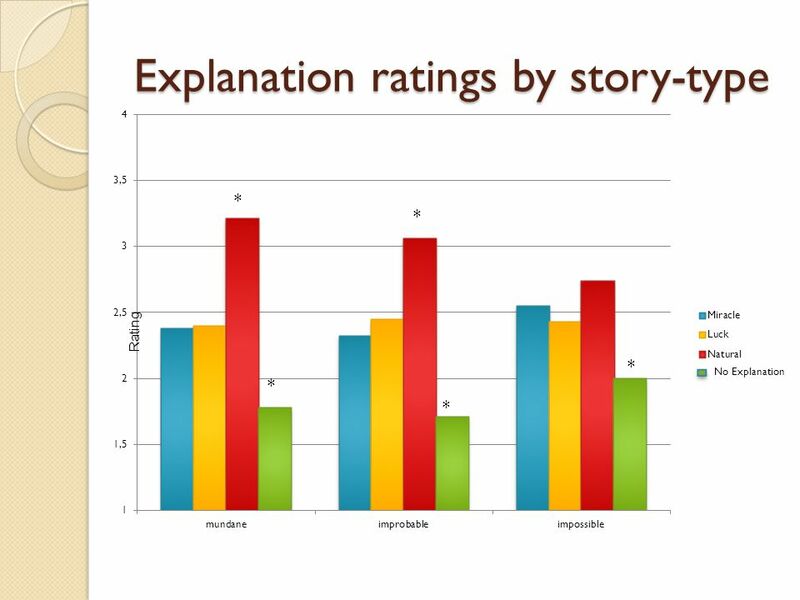 (Explanation varied depending on the story.) 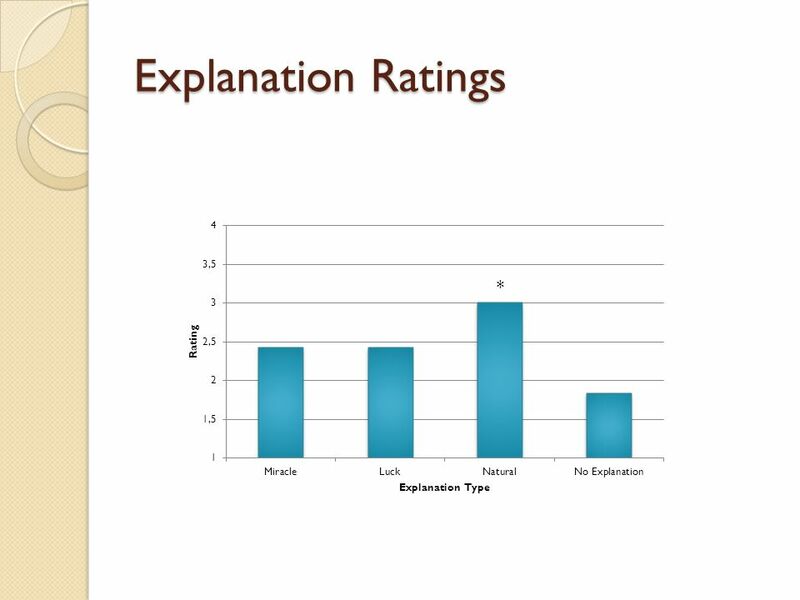 No explanation – Parker said that it’s really hard to explain; there’s no way to explain it. 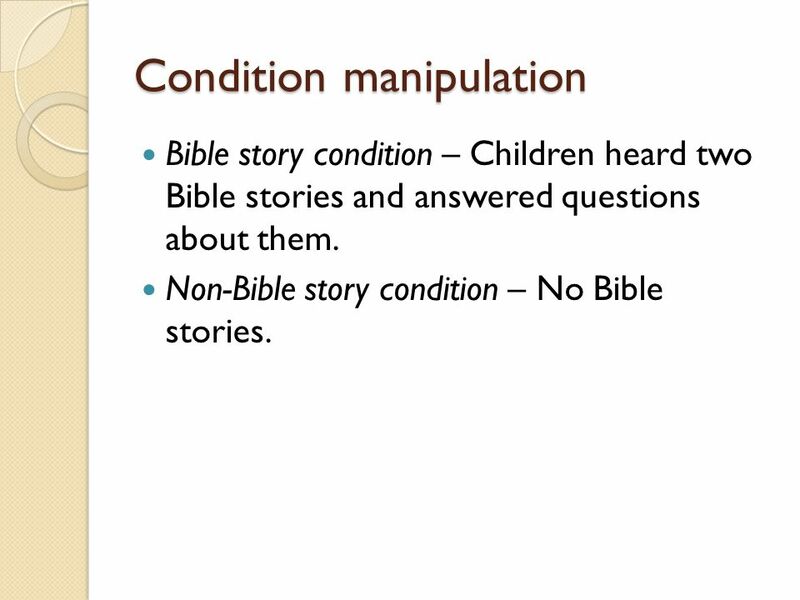 15 Condition manipulation Bible story condition – Children heard two Bible stories and answered questions about them. 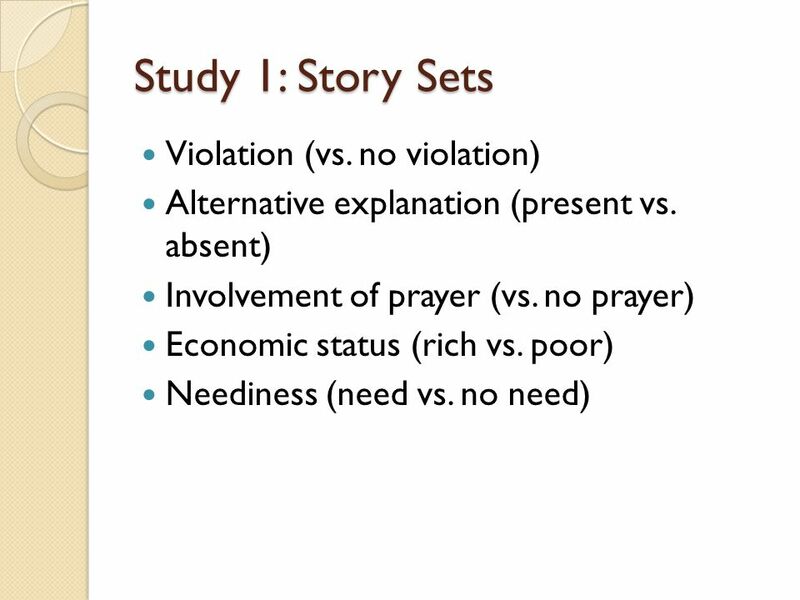 Non-Bible story condition – No Bible stories. 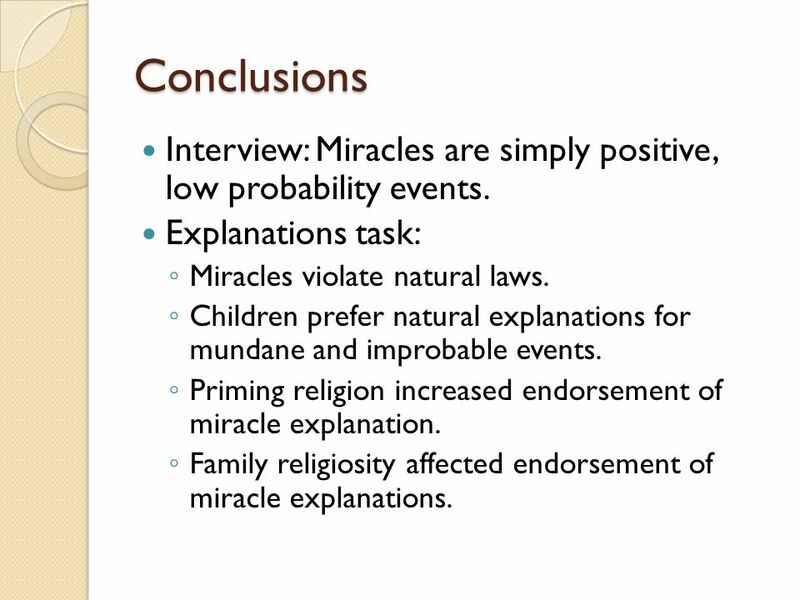 21 Conclusions Interview: Miracles are simply positive, low probability events. 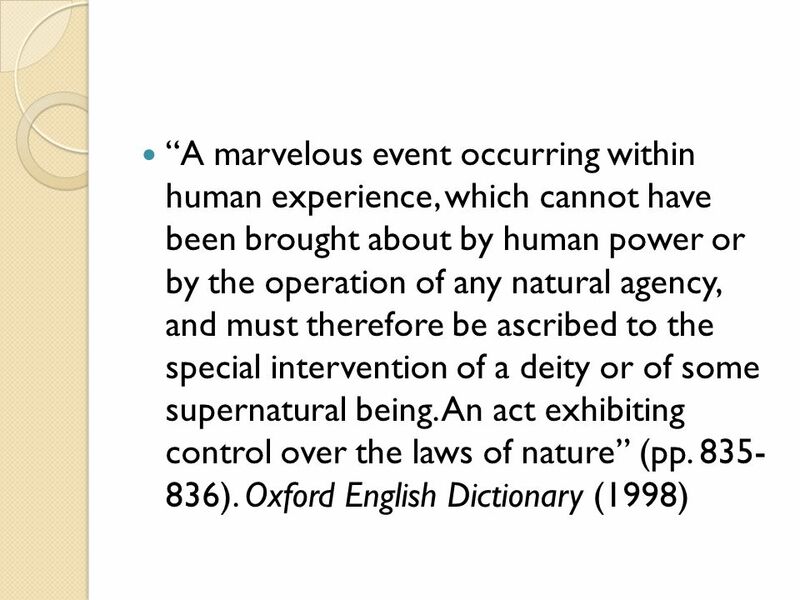 Explanations task: ◦ Miracles violate natural laws. 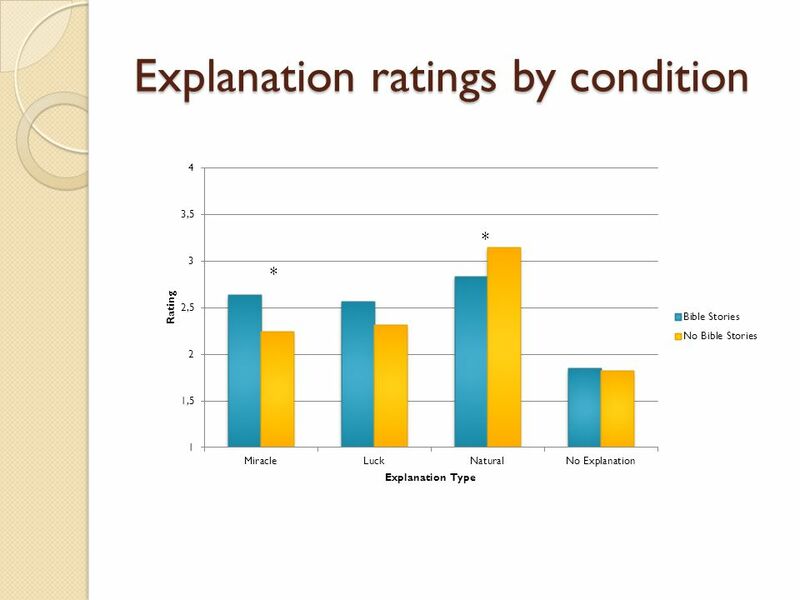 ◦ Children prefer natural explanations for mundane and improbable events. 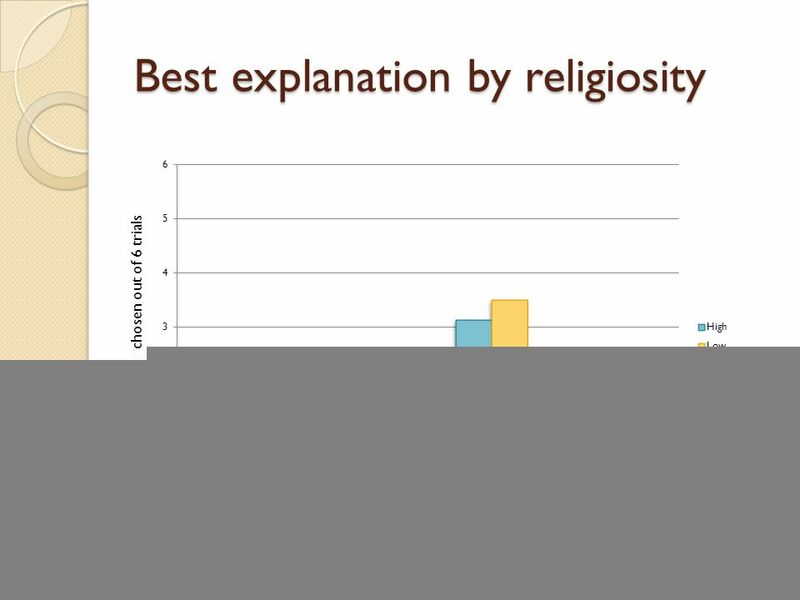 ◦ Priming religion increased endorsement of miracle explanation. ◦ Family religiosity affected endorsement of miracle explanations. 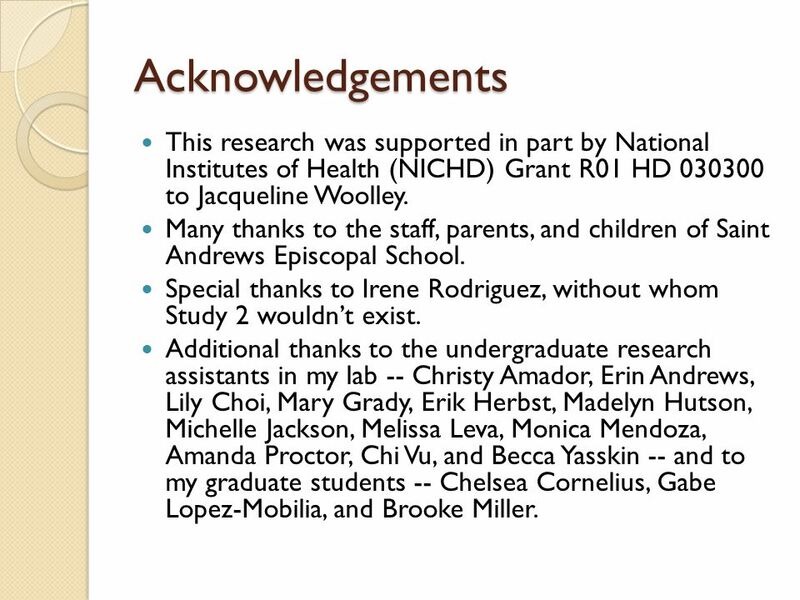 22 Acknowledgements This research was supported in part by National Institutes of Health (NICHD) Grant R01 HD 030300 to Jacqueline Woolley. Many thanks to the staff, parents, and children of Saint Andrews Episcopal School. Special thanks to Irene Rodriguez, without whom Study 2 wouldn’t exist. Additional thanks to the undergraduate research assistants in my lab -- Christy Amador, Erin Andrews, Lily Choi, Mary Grady, Erik Herbst, Madelyn Hutson, Michelle Jackson, Melissa Leva, Monica Mendoza, Amanda Proctor, Chi Vu, and Becca Yasskin -- and to my graduate students -- Chelsea Cornelius, Gabe Lopez-Mobilia, and Brooke Miller. 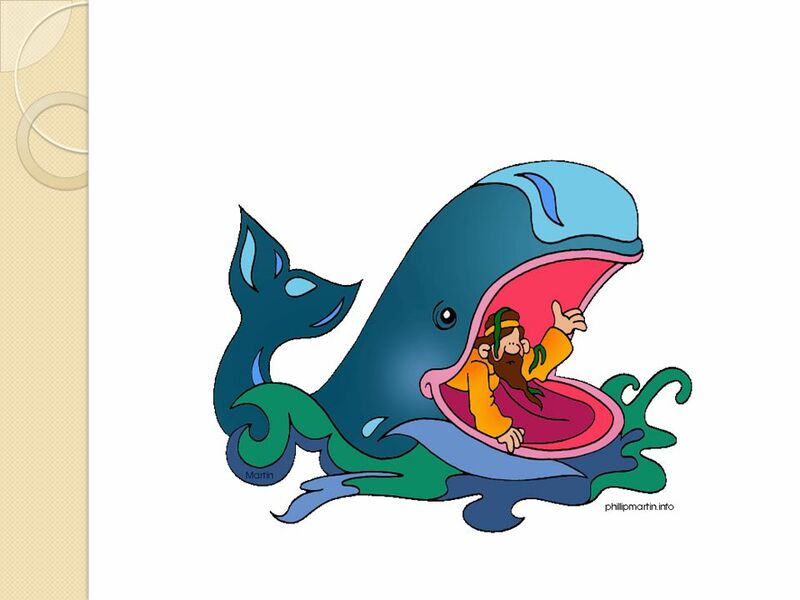 Download ppt "Children’s concepts of miracles Jacqueline D. Woolley The University of Texas Jean Dunham The University of Texas Southwestern (UTSW) Austin." COGNITION. 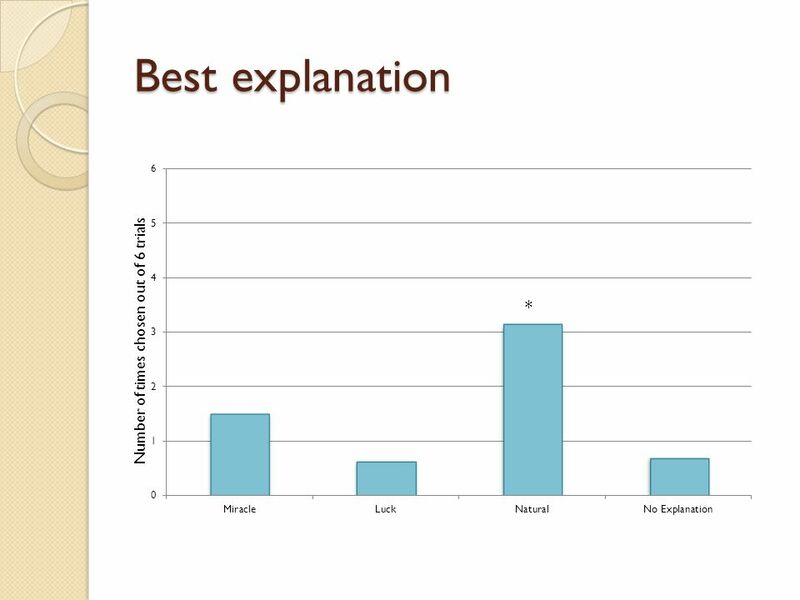 Cognition Questions Do you have difficulty remembering or concentrating? Split Interviews: How often do you have difficulty remembering important. My Favourite Pet By Gabe Dodd As long as I can remember, I’ve always wanted a dog. Well that need became real and at the age of 6 I had received my dog. What is reflection?  “Reflection is a form of mental processing – like a form of thinking – that we use to fulfill a purpose or achieve some anticipated. Religious Upbringing Some Christians baptise their children at a young age The child is usually taught to pray and they go to church. Families usually. MOM AND DAD I’M GOING TO COLLEGE. A PRESENTATION TO THE STUDENTS AND PARENTS OF PATRICK HENRY SCHOOL PRESENTED BY GEORGE DOOLEY COUNSELOR, SCHOOL OF CONTINUING.